During this project-based learning exercise you will be working in a team to design and build a system that is used to explore the planet Venus. You will develop robots equipped with sensors and actuators which drive over the surface of the planet. These robots need to cooperate with each other to complete several challenging tasks. In a final competition, the robots of all teams will compete against each other. The team which build the robots that are able to complete all tasks in the least amount of time will be the winner of this competition. 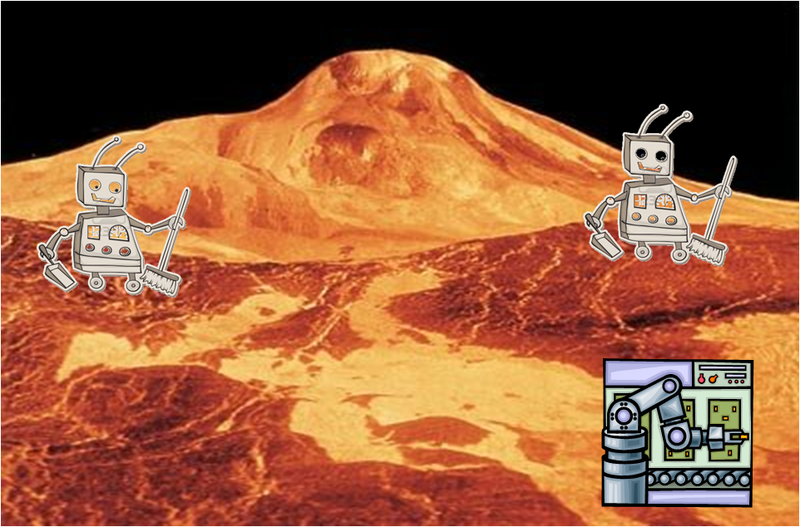 After a long journey through space, your robots will land on the planet Venus. The first location where the robots touchdown will be known as the base camp. From this location, the robots need to start their exploration of the planet. They need to navigate through a maze of steep hills and craters. It should be avoided at all cost that a robot falls into a craters as this will lead to the permanent loss of this robot for the expedition. While exploring the planet, the robots need to find three different rock samples that are hidden somewhere on the planet. Each of these samples needs to be found and brought back to the base camp. At the base camp, the samples need to be assembled and placed into the rock analysis laboratory that is available in the base camp.